Hi, Odette. Hope all is well. My ballet school recently came out with their summer ballet schedule. Unfortunately my school is too small to offer a pre-professional ballet summer intensive, however their are many ballet classes offered Mondays-Fridays in my school's eight week ballet summer program. I have strengthened my legs tremendously since my teacher told me I couldn't start pointe. 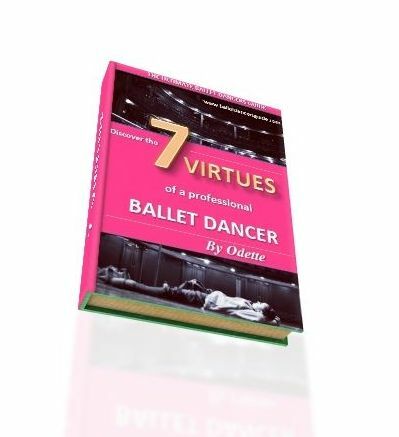 My calves have become very well developed and I have definitely strengthened my posture at the barre and I continuously hold suffiecent turnout so, I have definitley become a stronger ballet dancer. I'm not sure what's going to happen this summer. I'm hoping to advance into my school's fourth ballet level this summer and hopefully then start pointe and if not then I hope to start it by August-September. That's all I think for this summer although I do hope to attend at least three times a week with my school. More would definitley be a plus, but that can certainly depend on my ballet class level for this summer and if I'm allowed to begin pointe work or not. Next summer I hope to attend a ballet summer intensive program and at a professional ballet school. I'm interested in Ballet West's progarm because well, I think the prices are very reasonable compared to other programs and the auditon process doesn't seem as intense as other ballet summer intensive programs. I'm going to have my mom e-mail my ballet teacher very soon about this and get feedback although I'd be lying to you if I was to say that I'm not completley terrified as to what she's going to say. I've had my heart broken so many times in ballet and I've spent so many nights crying myself to sleep over things like starting pointe work. So, what's to happen I guess only a very very short amount of time can tell, but I'll let you know what happens when I find out. I've doubled my sterngth in ballet, there's no doubt about that, but I still keep asking myself "Will that be enough?" Also, one more thing have to talk to you about Odette, is resumes. I know that many ballet dancers start their company audition by sending in a resume to the company artistic diretor so,obviously I definitely want to create a highly impressive one. (although I have definitley taken into consideration about what you have said about living in the moment). My dream ballet company is the Joffrey Ballet Chicago. I was looking at the dancer bios for the Joffrey and for other ballet companies and something that catches my attention every time is the diversity in the dancer bios. Some of them have spend their entire lives at the School of American Ballet and have attended summer intensives at Houston Ballet, Boston Ballet, Miami City Ballet, and Pacific Northwest Ballet, and some of the dancers spent 75% of their balet training with a local ballet school and still managed to dance ballet professionally with a top ballet company. Why is that??? What made the artistic director read their resumes and go, "Yeah I want to see her dance at a live audition."??? ?It doesn't really make much sense to me. "April Daly joined The Joffrey Ballet in August 2003 after performing for two seasons with The Washington Ballet. A native of Rockford, Illinois, Ms. Daly studied with the Rockford Dance Company and later with New School University in New York." And after Daly's short, short, short bio here's Hickey's!! "Jaime Hickey joined the Joffrey Ballet in 2009. Born in Bayonne, New Jersey, Ms. Hickey began her dance training at Ms. Huguette’s Dance Studio in addition to being a competitive Irish Step Dancer with the DeNogla School of Irish Step Dancing. She continued her training with the New Jersey School of Ballet and one year later attended Walnut Hill School. In 2006, Ms. Hickey was accepted into the Jacqueline Kennedy Onassis School at American Ballet Theatre. After returning to New York, she also continued her private training with Fabrice Herrault. Jaime attended summer intensives with The Kirov Academy, The Rock School, Studio Maestro, Kaatsbaan, and San Francisco Ballet. In 2007, Ms.Hickey was named a National Training Scholar after attending the ABT summer intensive and also joined ABT II under the direction of Wes Chapman. Her repertoire while with ABT II included White Swan Pas de deux, Jerome Robbin’s Interplay, George Balanchine’s Allegro Brilliant, Raymonda, and Anthony Tudor’s Continuo." please please explain this highly highly confusing topic to me and let me know what you think about my summer it would be EXTREMELY helpful!! Thank you thank you thank you!!!! I am so so happy to help you, there is so much knowledge I feel I can pass onto you so it is great we can keep in close touch. Personally by just reading the way you talk, you amaze me in your high intelligence and commitment to ballet at such a young age - 13, if I remember rightly. You sound extremely smart which I can tell you from experience, is A LOT to do with making it as a dancer. I very pleased to hear you have strengthened as a dancer. To be able to evaluate yourself like this is very good and give yourself a big well done for improving so much. I must tell you a CRUCIAL tip which you are well on the way to achieve, because in dance 'contacts' is very valuable to have as a dancer to become a professional. The more people/ teachers/ schools/ companies you know the better. Only because you are talking about summer programs and it reminded me how important these occasions are for you. You may not realise at the time, but in the future you will look back and be so pleased you attended all those summer programs. Let me give you a true example. When I was 18, nearing onto my professional career, I attending a summer program for 2 weeks at a professional company that held special intensives for younger dancers. I didn't realise at the time, but this program was KEY for me to get recognised by the director and ballet mistress of the company. The director came to watch at the summer program and the ballet mistress taught some of the classes, so I worked hard and gradually they began to take an interest in me. By the end of the course, they told me to keep in touch because I was still studying at school. Then, one year later when it was time to audition for ballet companies, I went back to this previous company I took the summer program at. Dancers from all over the world auditioned for the company and some of them even had better training than me and had achieved more in competitions. Even so, the director gave ME the job over the rest of the dancers and I can tell you it had A LOT to do with I had made 'contact' with him before and he knew me already as a dancer. So when it comes to auditions, it isn't all about whats on your resume. I got my second job through 'contacts' and then a live audition, i don't think the director even judged much at my resume. However, I did get my first job through my resume because I had enough experience and training for the director to want to see me dance. It is a puzzling subject to HOW some dancers make it professional and WHY others don't. I saw many dancers with top world class training struggle to get a job over others who had much less training. Whether it is luck, contacts, or natural talent? I do know for SURE though, that if you are not smart and active this has a lot to do with your success of getting a job. When it comes to your resume, the director will mainly look at your training first and then your performance experience. When I was writing my resume, my school guided me and we had to make it only one page long. It was VERY neat and compact with only the essential information that the director needed to know. It should have a certain format too such as short opening paragraph of your previous and current training as well as any recognised teachers that have taught you. Then, you should list your performance experience starting with the most recent. You can list any competitions, awards and summer programs after with any references at the bottom. Your resume is a very concise piece of paper that also includes your name, email, height and weight.... it is factual and business-like! You can send videos and photos all which give a chance of the director inviting you for a live audition. How a lot of dancers get jobs is because of what the director needs at the time. He may be looking for a small, tall, male, female, young, experienced.... all of which he CAN see instantly from a resume which is why they are very convenient for auditions. I could talk forever giving you advice, so that's all for now - until next time Jacqueline! Keep working hard, you are doing great! Hi, Odette just wanted to say thank you so much! What you said has definitley helped (as always), and it's really interesting. I will definitley pay attention to this and make sure to do plenty of ballet summer intensive programs to get noticed. I will also make sure to get good solid training (which I'm already doing a pretty god job of).